Zoey Ivory, 23 years old, is a professional model and dancer who studied at the University of Education and Institute for Performing Arts. Ivory has studied many types of dance styles, and continues to express herself through movement. Know more about her in this Beauty Talks. 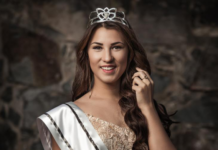 As Miss Netherlands I am the ambassador of “Stichting Hulphond”. It’s a non-profit organization that trains dogs to aid adults and children with physical disabilities, veterans with PTSD and children with mental problems. But the fun fact is, I love dogs very much but I’m hyper allergic! I really wanted to stay ambassador, so I always have to take medicine and carry an EpiPen with me in case I get an attack. My biggest mistake was listening to people who told me I wasn’t good enough. From 10 years old until 18, a teacher at school told me every day that I wasn’t good enough. It really damaged me and it eventually made me lose my passion for dance and the trust and love in/for myself. I gained more confidence with finding a new passion (modeling) and after a few years I tried taking dance classes again. And after a lot of trying, I finally felt good again. So please never believe people when they tell you, you’re not good enough (even if it’s their way to motivate you), never stop trying! Always believe in yourself and go for your goals. My country is very multi cultural and diverse, all nationalities are welcome in the Netherlands. We have beautiful green landscapes with the traditional windmills and flower fields, but also big cities like Rotterdam and Amsterdam. Amsterdam is an old and charming city with amazing architecture, beautiful canal houses and a relaxed vibe. It has the reputation that everything is possible there. You can really be yourself and you will not be judged. Besides heating up my eyelash curler to make them even more long and curlier, I only drink water or green tea, which gives me great skin. And a not so uncommon beauty secret is cleaning your face every morning and evening with the right products for your skin type. What is the most difficult thing you did to prepare for the Miss Universe pageant? Everything is new for me. Miss Netherlands was my first pageant and so I had to learn a lot about Miss Universe. I think the most difficult thing for me was really getting the difference between a fashion model and a Miss. And letting go of my fashion model habits. Yes, I think it’s an advantage to everyone. Social media is a great way to express yourself and give your followers a peak into your life, which gives them a chance to get to know you better and that is great. You have a chance to already show your character and I feel that it can bring people closer. Of course looks count in a beauty competition, but it’s not just about getting a sash and a crown, it’s much more than that. We all have strong opinions and are women with a purpose and a voice that wants to be heard. Miss Universe is all about letting women feel they are confidently beautiful, so what is more inspiring than all those women, confident and beautiful in their own way, who want to contribute and try to make a difference in the world? Honestly I have to say Miss Universe 2015 Pia Wurtzbach, I find her background story so inspiring. She’s a woman that never gives up and goes straight for her goals, which I can really relate to. My special education (School of Performing Arts) really formed me as a person. I have always been taught to give everything you do a 101%, even when you’re sick or in pain, which makes me really disciplined and focused. Because of that I’m a fast learner and can copy movement really quick. Appearance wise, I have a lot of different looks. I can be really natural with freckles and curls or have a glamorous looks with straight hair and lush curls. Adjusting to every situation is one of my strong points. Besides that I have a real passion for helping people in a lot of different situations, which also contains charity. As Miss Universe you have such a big platform to do this (for example being an advocate for HIV), I just want to spread awareness for different good causes and help as many people as possible. Lastly, a message for all your supporters at Missosology.